Bomberman (also known as Dynablaster or Dyna Blaster in Europe) is a strategic, maze-based video game franchise originally developed by Hudson Soft. The original game was published in 1983 and new games have been published at irregular intervals ever since. Several titles in the 2000s were published by fellow Japanese game company Konami, who gained full control of the franchise when they purchased and absorbed Hudson in 2012. Today, Bomberman has featured in over 70 different games on numerous platforms (including all Nintendo platforms save for the 3DS and Wii U), as well as several anime and manga. His franchise is one of the most commercially successful of all time. The general goal throughout the series is to complete the levels by strategically placing bombs in order to kill enemies and destroy obstacles. Exploding bombs can set off other bombs, kill or injure enemies, and destroy obstacles. However, they can also kill or injure the player character, destroy powerups, and sometimes "anger" the exit, causing it to generate more enemies. Most Bomberman games also feature a multiplayer mode, where other Bombermen act as opponents, and the last one standing is the winner. In this mode, powerups are plentiful. 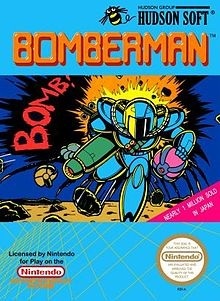 Although most games in the Bomberman series use the same type of maze-based levels established by the original game, some are Zelda-like adventure games, Mario-like platformers, Tetris-like puzzle games, and kart racers. It is considered to be a classic franchise by many video game players.